Do you do morning work in your classroom? I never had until this year. I'm at a new school and they have students get breakfast in the morning and bring their breakfast to the classroom to eat, but they have a tendency to then get very chatty right when I want them settling in to the school day. SOOO... morning work! I've seen great packets of morning work for 2nd grade and such on TpT, but I haven't found a solid packet in Spanish and I wanted something that wasn't going to eat up a lot of my time and energy in preparing. So this is what I came up with, and so far it's working out quite well! My morning work is tied to my Star of the Day, so I'll explain that first. 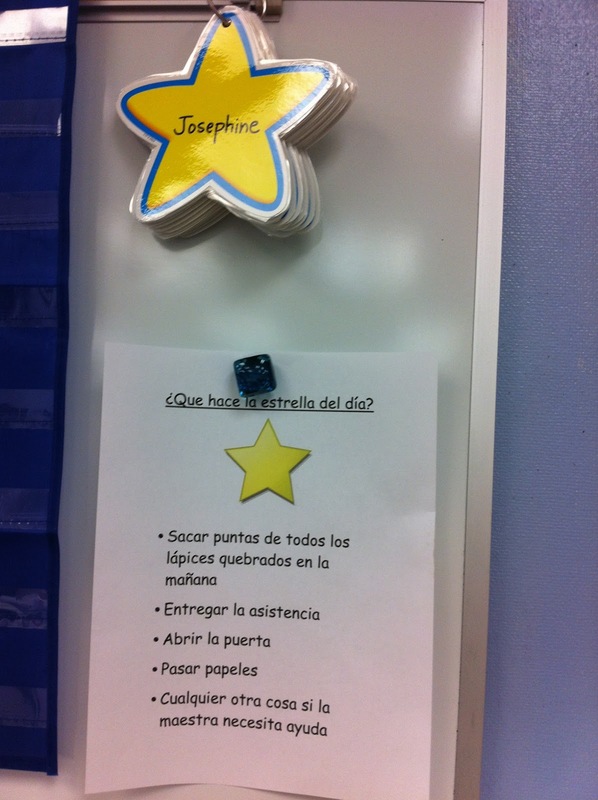 I have a Star of the Day in my classroom because I wanted to make classroom jobs easier and more streamlined. My Star of the Day is my helper for everything for that day. 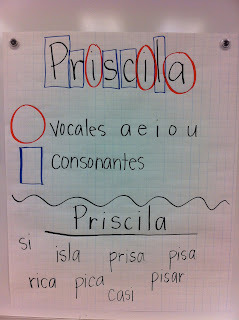 Here's a little chart I taught at the beginning of the year so kiddos know what to do when it's their turn. Sorry it's small, but if you want to see it close up just click on the photo to make it larger. I have all of their names on laminated stars on a binder ring, so I can just flip it each morning. Then I use the Star of the Day's name for the morning work. 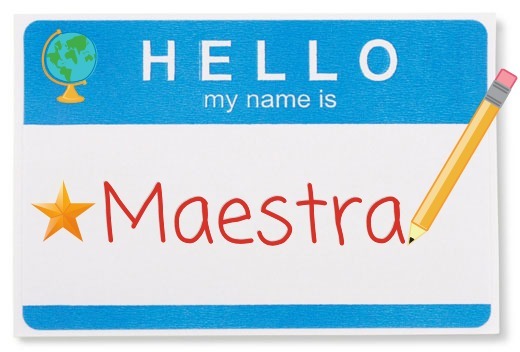 Students have been taught to come in and get their morning work booklets out (just construction paper and writing paper cut and stapled to make a booklet), and write the name of the star of the day. We started with just first names, but then I started adding last names to give them more letters to work with. Then, they find and circle all the vowels. They put a rectangle around all of the consonants. The final thing they do is to look for words they can make only using the letters from that person's name. Here is my sample that is still up on the wall until the routine becomes second nature. 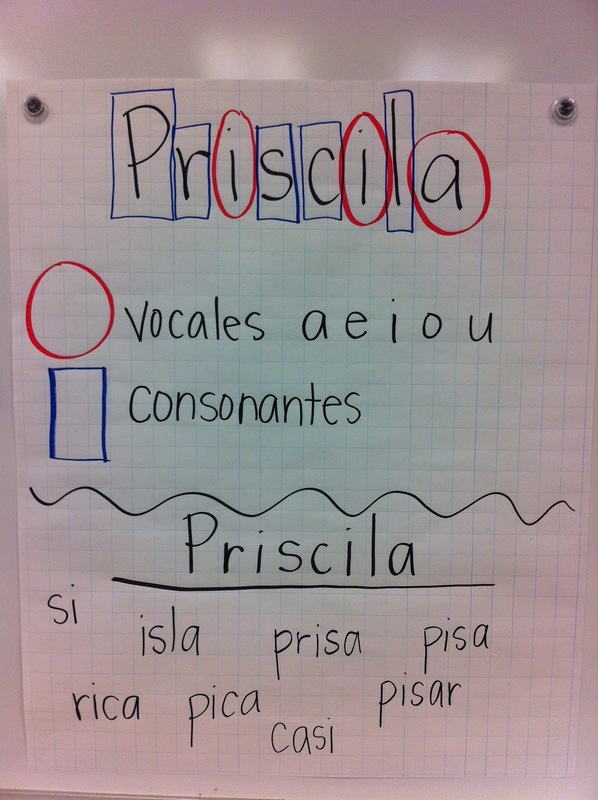 It's is a very simple example from the beginning of the year, but it gives the general idea of what they do. As time goes by, I'll up the ante by not accepting 1 or 2 letter words. Another thing you can do to extend the task and add some math practice is have them count the number of vowels and consonants and add them together. There are many more ways to modify and extend, but this is a good start for now! I'm really enjoying watching them work out words and get excited when we come up with a lot as a class (I've been correcting it with them after they're done - that won't last forever). To date, the record is 37 words! I love the Star of the Day idea, also how they make new words using their names...lovely! 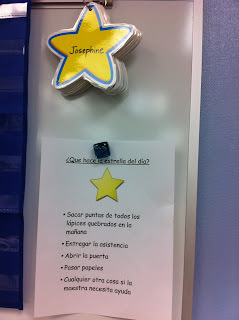 I also do the star of the day idea rather than assigning classroom jobs. It works really well for me! Your morning work idea is so cute and simple. Love it! HOLA! I'm a second grade bilingual teacher in Spain. It is so awesome finding more bilingual teachers out there. I am following you! I love the making words with student names. I am sure they love trying to beat the record to see how many words they can make.